Sangita Thiyam was crowned ‘Orange Queen 2017’ of Manipur. 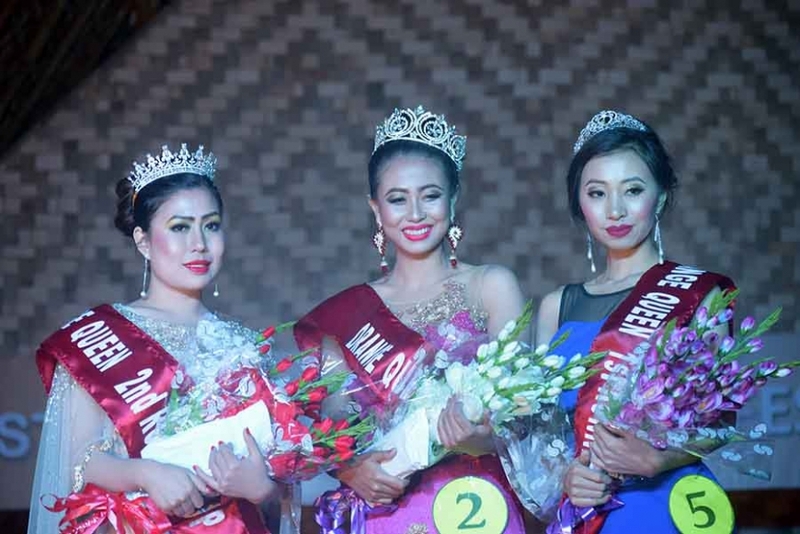 She was contestant no 2 in the beauty pageant held Thursday night at the main venue of the Orange Festival, Lower Ground in Manipur’s Tamenglong district. She is the daughter of (Late) Thiyam Ibotombi Singh of Irom Meijarao, Imphal West. Contestant no 5, Lumgailiu Panmei was adjudged first runner-up, while contestant no 22, Keipila Lovety Maram had to settle for the second runner-up title. Best design was bagged by Blendina who designed the dresses for Lumgailiu Panmei. Other eight sub-titles won by the contestants included, Miss Congeniality by contestant no 5, Lumgailiu Panmei, Miss Beautiful Eyes by contestant no 16, Alicia Sagolsem, Miss Beautiful Skin by contestant no 22, Keipila Lovely Maram, Miss Beautiful Hair by contestant no 9, Achong Haokip, Best Catwalk by contestant no 2, Sangita Thiyam, Face of Tamenglong by contestant no 12, Christina Thiumai, Miss Beautiful Smile by contestant no 1, Agenes Zeliangrong and Miss Photogenic by contestant no 17, Ketuni Phre-e Qwiree. All the 23 contestants of the beauty pageant were trained by a photographer and choreographer based in New Delhi, J Robert Rouveio Pao. Sangita walked away with a cash prize of Rs 1,50,000 while the first and second runners-up got Rs 75,000 and Rs 50,000 each. The sub-titles awardees got Rs 15,000 each. During the event, a two-minutes silence was observed to show respect to Lt Guru Jiangam. The event was also attended by CO 23 Assam Rifles Tamenglong, Col Chinmaya Verma, former Miss North East, Soma Laishram, Deputy Commissioner of Tamenglong, Armstrong Pame and Dr Manish of 2nd IC 23 Assam Rifles as special guests. Meanwhile, Armstrong Pame has announced that winner of ‘Face of Tamenglong’, Christina Thiumai will be representing the district in Tamenglong calendar of the coming year. The Orange Queen Contest was supposed to be held on December 10, which was the closing day of State Level Orange Festival but it was postponed due to bad weather condition.